Lock in a great price for Hotel Costa Galana – rated 8.7 by recent guests! Great buffet breakfast and extremely helpful staff. Nice and Kind staff, very confortable bed, low noise, beautiful facilities, very well located. Great view of the ocean from our room, great location, and very friendly and helpful staff. This hotel it's a classic. In almost every way. Even with some elements of technology (it does have free wifi and flat screen tvs on every room) the whole atmosphere it's based on making you feel part of the golden era of hotels. It has a decent pool and a spa. Staff is super friendly and correct. Breakfast has most things you could want. Location it's amazing. It has parking but not sure if it is free or not. The bed and the view from the room were super cool. Excelente...el staff de recepcion profesional y diligente..fully met my expectactions...last time I stayed my husband noticed that the elevators were a bit too slow...now they work perfectly well...Thansk everyone for your kindness I would definetely recommend it...last but not least ...the doorman! Such a nice fellow! Amable y con una sonrisa. All the time! the spa was well equipped and the attention at the hair salon was outstanding. Andrea was very kind with us and made us look beautiful. The room view was amazing! The staff, especially the 2 young ladies in Guest Relations, were very helpful. Overall, the property was great and we would recommend it to anyone. Everything was perfect. People facilities location. Greatly recommend!! Great location! Just a few steps from the beach, close to nice restaurants and shops as well. Staff super friendly and professional. The atmosphere is great, warm and welcoming. The beds are super comfy, housekeeping staff is brilliant! They left a cake for my birthday. Lot of details that make you feel like ‘home’ but with the luxury of 5stars hotel. El desayuno es muy bueno, las habitaciones son muy comfortables y el personal súpero amable. Hotel Costa Galana This rating is a reflection of how the property compares to the industry standard when it comes to price, facilities and services available. It's based on a self-evaluation by the property. Use this rating to help choose your stay! 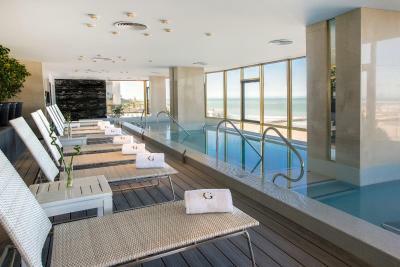 One of our top picks in Mar del Plata.Located on the seafront of Bahía de Playa Grande in Mar del Plata, the Hotel Costa Galana offers elegant accommodations, fine cuisine and various business and leisure facilities. This 5-star hotel gives guests free access to its spa with small hot tubs, sauna and massage services. Free WiFi access is provided. Each room is fitted with a TV, a mini-bar and private bathroom facilities. Some include a spa bath, a work desk and a dining table. 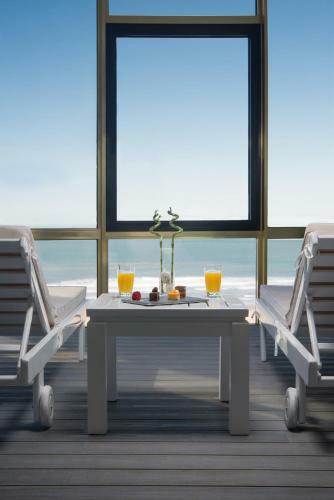 Guests can opt between views of the sea, partial ones or views of the city. Hotel Costa Galana offers a swimming pool, gym and beauty salon. Varied dining options are found in the La Terraza and La Bourgogne restaurants. Guests can end their day with a relaxing drink in the cozy La Promenade bar. The hotel also offers a complete range of services for meetings and events. Golf Club Mar del Plata is 1,000 feet away, whereas Torreon del Monje is 1.2 mi from the property. When would you like to stay at Hotel Costa Galana? This room offers a king size bed, LCD TV, and a partial view of the sea. A child under 12 years old can be accommodated in an extra bed for an additional fee. This room features 1 king-size bed and partial ocean view. It includes a 40" LED TV, a mini-bar, a dining table and a work desk. The private bathroom features a bathtub. The room is located from the 4th to the 14th floor. It is painted in earthly colors (light green and light blue) and can not accommodate an extra bed. This suite features a 40" LED TV, a mini-bar, a work desk and a dining area. The private bathroom is fitted with a spa bath. This unit offers views of the sea. They are located from the 8th floor up to the 14th floor. A child under 12 years old can be accommodated in the sofa bed. This room offers 2 single beds and a partial view of the sea. This suite features a 32" LCD TV, a mini-bar, a work desk and a dining area. The private bathroom is fitted with a bathtub. A child under 12 years old can be accommodated in an extra bed at an additional cost. This room offers 2 single beds and a beautiful city view. It includes a 32" LCD TV, a mini-bar and a dining table. The private bathroom is fitted with a bathtub. Note that this room does not allow extra beds. The unit can fit up to 2 adults plus one baby under 2 years old in cradle, which is subject to availability. This suite features a 46" LED TV, a mini-bar, a work desk and a dining area. The private bathroom is fitted with a spa bath and a shower. Guests can opt between partial sea views or views of the pool. Note that this unit cannot fit extra beds. This suite features a 46" LED TV, a mini-bar, a work desk and a dining area. The private bathroom is fitted with a spa bath and a shower. The unit offers views of the sea. This suite features two 40" LED TVs, a mini-bar, two bathrooms and a dining area. It includes a separate room with a work desk. This unit offers sea views. House Rules Hotel Costa Galana takes special requests – add in the next step! Other Cash Hotel Costa Galana accepts these cards and reserves the right to temporarily hold an amount prior to arrival. Hotel Costa Galana accepts these cards and reserves the right to temporarily hold an amount prior to arrival. Please note that the Honeymoon Suite, Superior Double and Superior Twin rooms cannot fit extra beds. 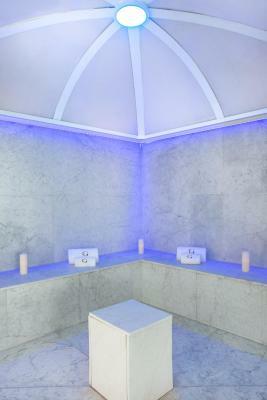 Please note the Spa services will be suspended from 8th to 11th April due to maintenance. Please note the based on local tax laws, all Argentinian citizens and resident foreigners must pay an additional fee (VAT) of 21%. Only foreigners who pay with a foreign credit card and debit card are exempt from this 21% additional fee (VAT) in accommodations and breakfast when presenting a foreign passport or a foreign ID along with a supporting document handed by the national migrations authority, if applicable. The service at front desk. We were over charged (we get charged taxes which we were exempt to pay for being foreigns) The process to clear things up was long and the person at the front desk not very nice. The food at the restaurant didn't meet our expectations and room service was beyond unacceptable. They hang up the phone several times when they listen us speaking english or told us ok to our request and never get what we ordered. The facilities could use some sprucing up, for example, changing the TV screens, which are 10+ years outdated. very professional , personal very aware . Probably not close enough to the downtown area. There was no pool available, small sauna room with few relaxing bed, air conditioning with low performance, food quality was a bit under the hotel standard. I can't think of anything that could be better! The service should have been better for a five star hotel. The cost per night, it's ridiculous. It's one of those "we will make you pay a lot because we know you are old and rich" kind of hotels. It doesn't even makes sense if you are a foreigner, considering you will find cheaper places everywhere on this coast city. If you are just looking to show your friends how rich you are or don't care about spending like a dumb new rich, then go away. Also, the carpet had stains, and the room didn't have anything that justified their rates.